My 14 year old niece and I made this bento lunch. The tree and squirrel are both cheese quesadillas. 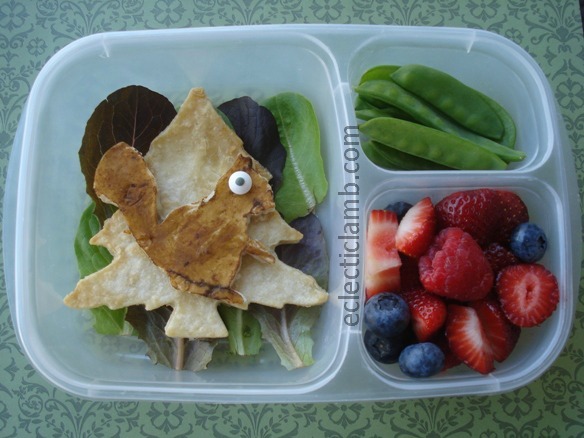 This entry was posted in Bento / Cute Food and tagged bento, vegetarian. Bookmark the permalink. Thank you Winnie! We have a lot of fun making cute food together. Adorable! Your squirrel is so cute. Love it! Our niece will probably tell you other squirrel stories about her uncle and his thoughts on squirrels! Thank you! Yes our nephew has told me some stories about his uncle and squirrels! Thank you! And yes I enjoy making bentos with my nieces and nephews. this one is very cool! Looking forward to more awesome bentos!